Two Anti-Trophy Hunting groups, Wildlife Defense League (so-called Canada) and Wolf Patrol (U.S.) will be answering a recent statement made by Sea Shepherd Conservation Society Founder and Captain Paul Watson, calling for action to stop the resumption of aerial hunting of wolves in British Columbia. Wolf Patrol and Wildlife Defense League members operate in the field, monitoring and preventing the recreational hunting of wolves, bears and other wildlife. The two groups are issuing their own “call to action” to the general public to help oppose this senseless slaughter. In 1984, Paul Watson established Friends of the Wolf, a group that worked out in the Canadian killing fields to stop wolf hunting and bring international attention to the issue of aerial wolf eradication programs. The so-called government of British Columbia has recently started killing wolves by helicopter again, claiming they are doing so because wolves are impacting the caribou population. It is widely understood and accepted that the decline in caribou herds is due to human caused habitat loss, not wolf predation. 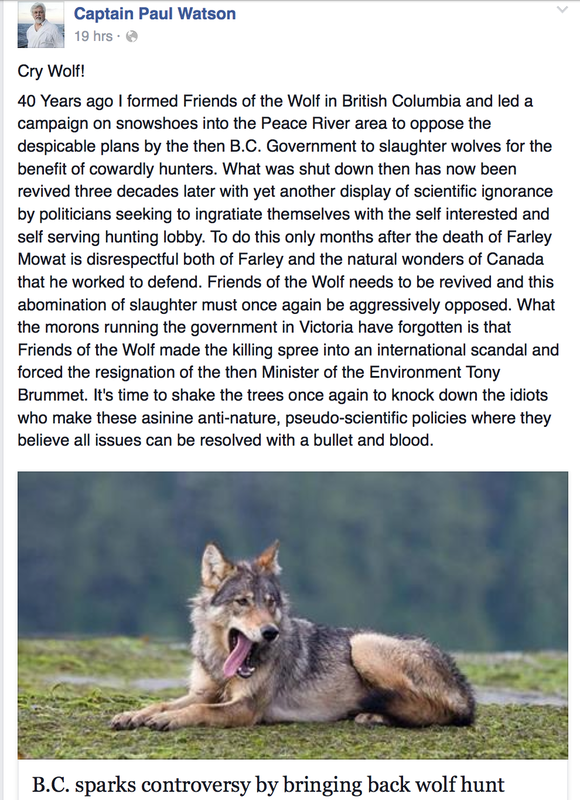 By resuming aerial hunting of wolves, Victoria politicians are using wolves as a scapegoat, rather than addressing trophy hunting of caribou or the real root cause of the population decline, habitat loss. Only just starting to recover from near extinction, gray wolves are still listed as an endangered species in most of America. 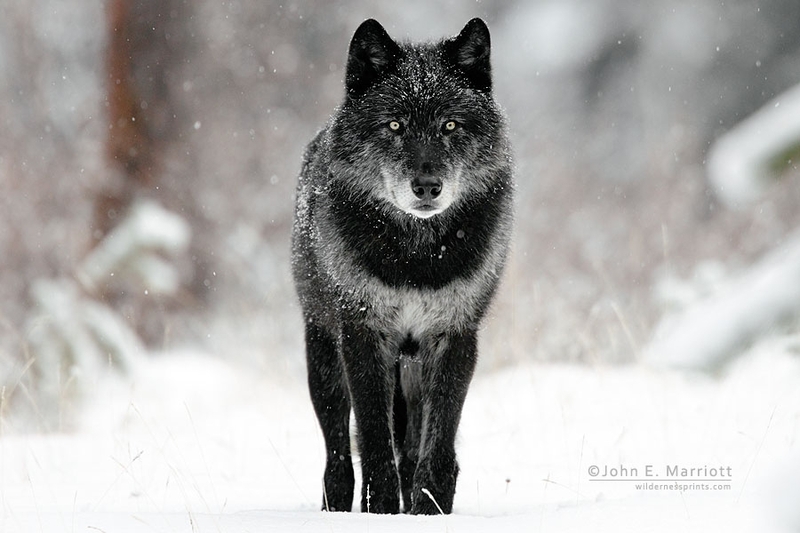 Sadly, states like Montana and Idaho are already running organized wolf hunting events, after only three years of regaining state control over wolf ‘management’. In the U.S. wolves continue to face many threats, despite the recent federal decision to wrestle control out of the hands of state agencies that were allowing trapping, snaring and even the hunting of wolves with hounds. Wolves in the lower 48 states still occupy only five percent of their original range and Wildlife Defense League & Wolf Patrol support their continued recovery to suitable native habitat across the North American continent. We believe in the complete restoration and recovery of apex predators to areas of North America where they have been eradicated by policies similar to those still being practiced by the governments of British Columbia, Idaho and Montana. If humans believe gray wolves are a problem, then let’s bring back the dire wolf too, which were the gray wolves ecologically-controlling superior. After literally centuries of persecution, Wolf Patrol, Wildlife Defense League and former crew members of Paul Watson’s navy are willing to stand in their defense until they are fully protected as a heritage species in all of North America. Wildlife Defense League and Wolf Patrol are recently established grassroots organizations working to stop the hunting of wolves, in the field, paws on the ground. Both groups are composed of veteran crew members of Captain Paul Watson’s Sea Shepherd Navy, and are heavily inspired by the work he has done defending wolves and other animals. In this day and age, we must think about the future. Our wildlife is being destroyed by maniacal psychopathic hunters. Wolves are being hunted and killed needlessly. We owe it to our future generations to protect our wildlife and learn to live WITH them, not against them. This country was theirs long before it was ours.